Getting to the top in your field is a great achievement. Staying on top is a whole different story. Sometimes people rise to the top and think that they have made it. But then some event happens and they fall back down again. Maybe you have been successful in the past. You probably excelled in one area so much that it was an unbelievable success. But it has already been many years since that happened. Today, you often catch yourself living in the past and talking about your past successes. But today things are different. You are not what you used to be. You are far from your past successes and your motivation and drive are not the same anymore.What happened? Life? Age? Have you been hurt so much in the process that you don’t dare to dream big anymore? Or do you simply don’t have the same drive anymore? Getting knocked down is a given. Getting back up and moving forward is a choice. In only 2 ½ years I became a self-made millionaire. I took my company public in the stock market and it was valued at over $300 million. I had built a worldwide organization and everybody loved me, I was the new rising star in the investment world. People looked up to me and I felt on top of the world. But then something happened. I trusted the wrong people and gave away too much control. The company’s stock price fell down to nothing because stock promoters had worked against me. Over $40 million of investor’s money got lost and everyone hated me. I got death threats and my reputation was destroyed on the Internet. During that time I fell into a depression, gained weight and lost all my money. I started drinking and my health suffered a lot. I was a broken man. I lost almost all of my friends and my life turned really bad. Success is never an accident and I know exactly what it takes. I also know how it feels to be at the bottom, to be broke and depressed. Luckily, I have found a way to get myself out of that hole and get back on top. At one point in my life I made over $100,000 per month and was a multi-millionaire, drove a Porsche and owned several homes. And just a few years later I was broke, in debt and at one point I had to live with a friend for 3 months because I couldn’t afford my rent anymore. Coming back from this was really my biggest achievement. Today, I have worked through everything emotionally and I am much wiser and stronger than before. I built myself back financially and my business life is back on top. I got divorced and remarried and I have four children, which really is the greatest wealth on earth. I am living my dream. I moved from cold Switzerland to sunny California and I am doing what I love. I can definitely say that I am a very happy person but I certainly had periods of sadness and depression. But those are the things that make life a more interesting story. When someone had to struggle and overcome obstacles is when the story of your life becomes interesting. I went from multi-millionaire to being broke. For a long time I struggled emotionally and my overall energy level and belief in my own abilities were at an all-time low. Today, I own several businesses again and I recovered financially and emotionally. I found myself again and I realized what I am here to do with my life and where my true strengths lie. I have a beautiful family and life couldn’t be better. I am living my dream and the lessons that I have learned during my hardship made me the person I am today. I became wiser and more experienced. My businesses are doing well and even though I am not making millions anymore, I generate several hundred thousands of dollars each year. It is only a question of time until I will reach millionaire status again because the foundation has been laid. But this time, things are much more stable and lasting. In this program I would like to share my lessons, experiences and insights with you. 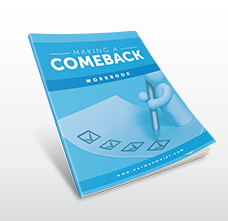 This program is a personal development program that will encourage you to make a comeback in your life. 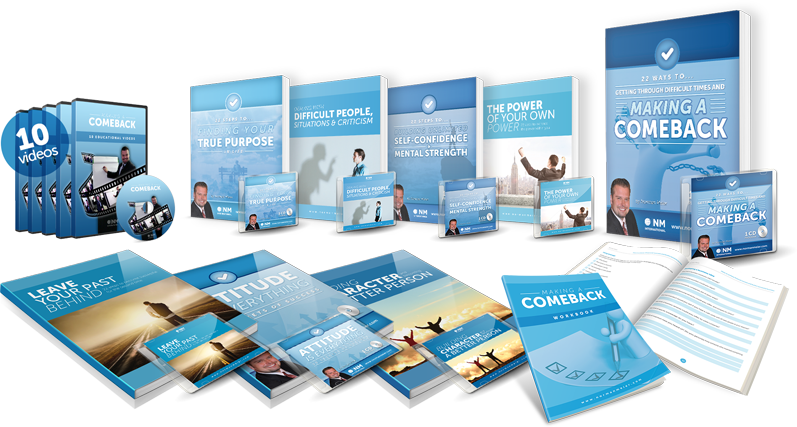 It is a series of eight different programs that explain how you can turn your life around again and be successful for the second time. This program is written in an easy to understand language and will motivate someone to deal with difficult situations and will give instructions on how to overcome them mentally. This program will help you to understand why you failed in the past and why you got sidetracked. It will help you to find true self again and will give you actual tips on how to make a comeback whether this is personally, financially, in sports, in business or in any other area of your life. What is your dominant personality type? Norman Meier’s Brochure ‘LEAVE YOUR PAST BEHIND 22 steps to become successful for the second time’ proves to be almost a revelation. It contains extremely valuable explanations and tips on how to find a new orientation and get rid of detrimental feelings rooted in the past. “Making a comeback” shook my thinking-literally. It is hard to imagine how, yourself, writing from a continent thousands of miles away from me in Africa, could speak to me so directly. Thank you for helping me now I realize that my biggest mistake was that I never forgave myself for my wrong decisions. Instead, I kept on beating up myself.